Brief Synopsis – A scientist and an OB/GYN conspire to get their new pregnancy drug funded by experimenting on the scientist..a man. My Take on it – This is a film that I’m actually a bit shocked to have realized that I never sw beforehand. As I’m trying to watch all of Arnold Schwarzenegger’s films, I finally got to this one. The premise itself seems a bit odd, yet it surprisingly isn’t as terrible as one would expect. 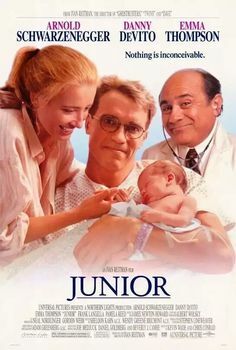 Arnie and Danny DeVito work well together and unlike in Twins (1988), DeVito plays a more sympathetic character and ultimately gives a much better performance in this film than his co-star. That largely has to do with the fact that Arnie is far from a good comedic actor and his attempts to have extreme reactions during his pregnancy seem a bit too over the top coming from him. Emma Thompson is a great actress but she and Arnie have no real chemistry together which takes away the plausibility of them being romantically together. That probably has more to do with the fact that Arnie isn’t really the romantic type than anything else, but it does hurt this film a bit. There are parts of the film that work better than others but there are enough that are enjoyable that make this film worth while to at least take a look at once despite it being far from perfect. Bottom Line – DeVito and Schwarzenegger are quite good here together eventhough as opposed to their performances in Twins (1988), DeVito gives the better performance this time. The story itself is a bit far fetched yet it somehow still remains humorous largely due to the extreme reactions that Arnie must perform due to his “pregnancy”. Thompson and Arnie have terrible chemistry but that also might have to just do with the fact that Arnie isn’t much of a romantic lead. There are parts of this film that are quite enjoyable so it can’t be completely written off.